But I did. First I start debugging, then click on the red dot to start tracing, then click on Resume to jump over first brake point and see my led blinking, i.e. the program runs but no output from printf(). I suspect your clock is not correct. Did you initialise clocks first before your tests. Also please verify that your debugger is not like these . These have problems with swv. My advise is to use a minimal project with correct clocks and use only itm_sendchar for testing. Last please enable LF external osc. I in fact use the one on the left shown in the picture... thought the hardware of the clones is the same. I now tried another minimal project with cubemx, no freertos and only 8MHz sysclk, no messages whatsoever. So the clocks shouldn't be the problem. I will try to borrow another programmer from a friend and see if that works. It is just interesting as with same settings printf() works on AC6 System Workbench and also in Eclipse after downloading the STM32 plug-in. However, Atollic feels more rounded up to me and I would prefer using it for my future projects. gosh is AC6 works for you i would stick to that ! Even when TrueStudio debugger works the SWV console hangs on me every few minutes so I personally am moving away from it. Friends with many years experience have moved to AC6 from IAR and love it..but not meant to be a tool discussion. One other thing though.. i have an STM32 Nucleo board so the on-board USB the only connection and S/T Link 2 is running over that. Since you are using a different USB interface I suspect there is something related to that. Ok, so today I tried an original ST-Link V2... and again nothing in my SWV. I was already about to give up and close all my programs when I had the ST-Link manual with its pinout right in front of me again. And there was another pin I have never seen before "SWO". 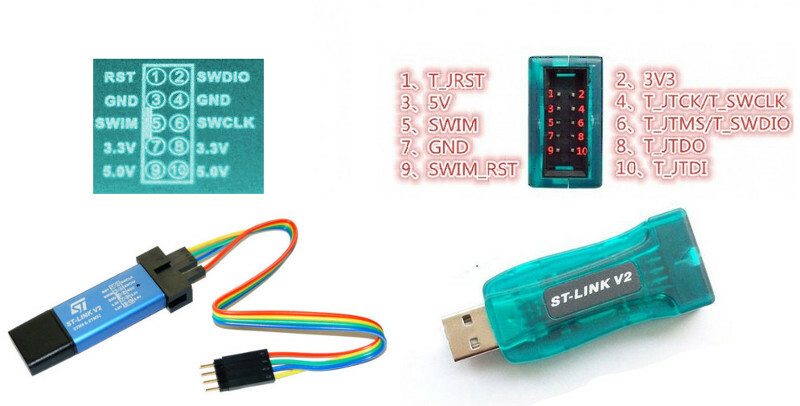 Turns out the ST-Link V2 clones do not have one and on my Blue Pill board it is not with the programming pins but rather between the other pins, i.e. all the time I only connected Vcc, GND, SWDIO, SWCLK. Wiring a 5th cable from SWO (PB3 on Blue Pill) to SWO on my programmer solved the problem. I don't know why CubeMX did not mark the pin as used when activating the serial wire debug under SYS. Using a china clone ST-Link, you actually have to solder a little bit to get tracing to work. In my earlier tests with AC6 System Workbench they probably used SWDIO to transmit printf() messages, but don't ask a noob like me on that one. Thanks everybody for the help. Hope this information will safe somebody a lot of try and error. oh wow...glad to hear you got it working and yes very valuable info! In CubeMX under SYS did you select Debug-> Serial or Debug->Trace Asynchronous Sw? To have CubMX enable SWO you need to select Trace Asynchronous Sw (changes from Orange to Green). You are right, under SYS I did in fact select Debug->Serial Wire. Changing to Debug->Trace Asynchronous Sw set the SWO pin as used. So I guess with the first option mentioned that should be debugging via SWDIO, whereas the latter one uses the Trace SWO pin. Just asking because no matter which option I select, Atollic seems to always use the SWO pin. Maybe because we are using the ITM_SendChar() function in syscalls.c. This leaves the question if it is also possible to redirect printf() to SWDIO in order to preserve an additional pin for other purposes. However, I'm already quite happy with the current situation.